At one of the steepest ski courses in the world. 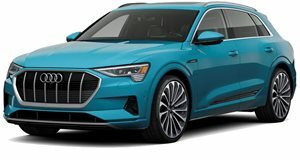 With 402 horsepower and 490 lb-ft of torque running through all four wheels, we knew the Audi e-tron would be a capable electric vehicle. But just how capable? Audi set out to demonstrate just that by running it up the steepest incline it could find: the Mausefalle section of the Streif downhill ski course in Kitzbühel, Austria. The slope has an incredible 85-percent gradient. That's almost as vertical as it is horizontal, but the E-Tron apparently had little trouble making it up the mountain. It just took a bit of modification, is all. The pre-production prototype was fitted with a set of spiked tires to give it more grip. Audi also had its interior stripped out and mounted a roll cage, racing bucket, and six-point harness to keep the driver – former World Rallycross and two-time DTM champion Mattias Ekström – in place. More to the point, though, it fitted the vehicle with an extra electric motor: where the production version has one motor on each axle, this one had one up front and two at the back to give it nearly 500 horsepower. And it reprogrammed the electronics for the purpose, too. Though measuring torque from electric motors can be a bit tricky, the automaker says this one was kicking out 6,579 lb-ft at the wheels. Suffice it to say, at any rate, that it had the muscle to make the climb.